Easier when you have control of weeds, see my other videos for advice on that with no dig. I show the two main types of bulbs, plus elephant garlic which is not a ‘true garlic’ and tastes of leek. Dates here apply to zones approx. 6-10, I am zone 8. Garlic is prone to rusty leaves and see how I manage to reduce rust. Harvest early rather than late and I show why. I show an easy way of storing garlic for many months of use. Great video Charles, thanks! I missed the autumn planting window so I’ve bought some Tuscany Wight and Solent Wight bulbs for planting now. 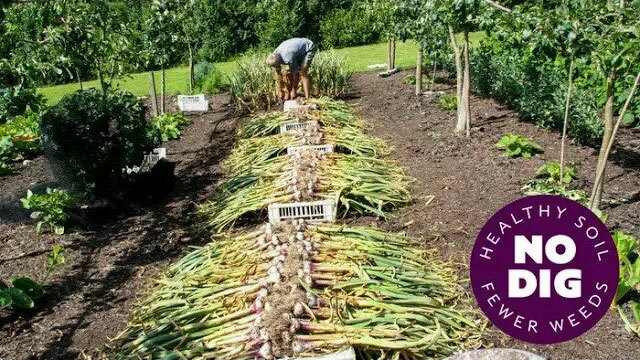 Have you any tips for starting garlic off at this time? Should I plant them in modules on heat to get them going or just get them straight into the ground? I’m in Cardiff, Wales, by the way. I was afraid of that! Thanks Charles – they’ll be in the ground this weekend.